I burst through the front door and headed straight for the fridge with such an intense desire that nothing could get in my way. I was simultaneously drawn relentlessly by food and immobilized to do anything else. I was locked in and zoned out. Little else mattered. I barely tolerated distractions. I didn’t bother to hang my coat in the closet or to look in on the sleeping kids. I dreaded my turn to drive the babysitter home because that meant a five, maybe 10-minute delay from doing what I HAD to do. I HAD to eat! My wife and I came home Saturday evening from our “date night” out – the one time during the week we could steal away for a few hours. I always enjoyed our time together but was often preoccupied with what was coming: my late-night binge. I was fixated on the Tupperware in the fridge: the brisket, the chicken, or the pasta. I was consumed by thoughts of consuming – the ultimate consumer. Did I feel hungry? Hardly. I had dinner before we left. Did I feel compelled to eat? Absolutely! Why can’t I control myself? Why can’t I just say ‘no’? I felt entitled to indulge. Left to my own devices, I would eat until I ran out of time or ran out of money. I’d eat when I was glad, mad or sad. I’d use food to reward myself and to distract me from things I didn’t want to think about – the perfect anesthetic. Fritos instead of feelings. I would stuff down my emotions with food. I’d medicate with meatballs to avoid dealing with life’s issues, secure in the knowledge that I could always write my own prescription. I copped to the cupcakes and caved in to the cravings. I fiddled with fad diets, endured half-day fasts and dabbled with diet pills. The stimulants didn’t magically make me lose weight, just eat faster. I had come to a demoralizing conclusion: maybe I was destined to be fat. Why bother fighting it anymore? Maybe lots and lots was my lot in life. Enough! I didn’t care anymore. I was at my bottom. The clarity and conviction I had in other aspects of my life completely escaped me when it came to food. Discipline and determination disappeared in the face of a donut hole. My “Saturday night” behavior, my late-night gorging and eating to excess were habits against which I felt I had no control. As hard and as often as I tried, I just could not win the war. Completely desperate and humiliated, I finally acknowledged that I had to stop working on dieting and start working on changing myself. Thus began my trek toward a life-changing transformation. That transformative trek began in the fitting room at Target. Sitting in the Target fitting room with a new pair of size 44 slacks in my hands, I felt the vast separation between my head and heart finally come together. For the previous half year, I had intellectually realized that I needed to make a wholesale change in myself, in my coping mechanisms with life and obsession with self-indulgence. Despite all the time, money and energy – all the sweat equity I invested in building up a sweat – I was intimidated to really go “all in.” That was the irony of it all. I went to great lengths not to go to ANY lengths. I realized I had a palpable fear of feeling restricted and deprived. I was enslaved by my entitlement to indulge. Saying “no” to my urge to eat felt like a colossal confrontation against which I cowered to contest. I was handicapped by my irrationality, living in the lie that only with excess food would I be sufficiently satisfied. For years, the distance between my head and my heart felt more like 18 miles than 18 inches. When it came to food, “No” had been lost from my vocabulary. An otherwise-ordinary summer day in a Target fitting room had become one of my biggest transformative moments to date at the time. This tsunami of a wake-up call led me to lose 130 pounds and begin a new chapter in my life – to bring a message and method of health, hope, inspiration and transformation to thousands of people around the world. 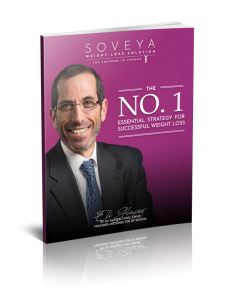 It’s truly a privilege to support and sustain the Soveya weight-loss community, where anyone can experience the freedom to change. This is just a preview of my story! I’d love to share my whole experience with you if you’re ready to start making real and sustainable changes in your life and with your relationship with food. Sign up for my mailing list and get a free PDF download of my complete story, plus free valuable insights, inspirations and practical tools to help you make the most important decision of your life. Are you ready for a new relationship with food--and with yourself?